The AKT-20-M AKT Solar Panel is an excellent panel for people with motor homes, caravans or boats looking for a cheap and simple way to power their appliances or to charge their 12 volt batteries. This 12 volt, 20 watt solar panel is also water resistant and sealed against the elements making it ideal for use in the garden to provide free solar power to power garden lights, pond pumps, as well as garden sheds and log cabin lights not connected to the utility grid. What makes the 20W AKT Solar Panel perfect for home use is that it is made using 36 long-lasting, high-efficiency, monocrystalline photovoltaic cells designed to give 20 watts of free solar power over a 25 years period. 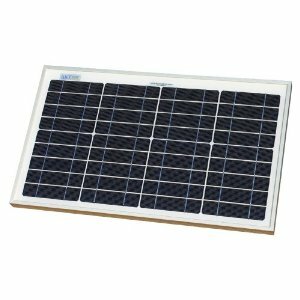 In addition, this 20W AKT Solar Panel comes complete with its own waterproof connection box and 1.8m of flexible cable allowing you to connect it with other solar panels to create higher voltage systems. This panel is one of AKT Solar’s range of top-quality solar panels available which challenges the current solar market by bringing some of the highest solar panel efficiencies in the marketplace, all at affordable prices. You will find this 20 watt, 12 volt AKT solar panel cheapest on sale at Amazon through this link right here. This voltage optimised 20 watt solar panel is ideal for use in 12V off-grid systems and charging 12V batteries. It’s rigid anodised aluminium frame and toughened tempered glass prevent damage due to frost, snow, hail and high winds giving it a design life of over 20 years of consistent free power. The 20W AKT Solar Panel can be fitted with a bypass diode making it perfect for placing in series with other panels to create higher voltage systems. However, as standard it does not have a blocking diode fitted and so should not be left connected to a battery overnight as it will allow charge to escape from your battery. Top of the range 20 Watt AKT Solar Panel with excellent performance even in low-light conditions. Made from 36 (4×9) high performance, high efficiency monocrystalline solar cells. 3.2mm tempered glass and rigid anodised aluminium alloy frame for exceptional strength. Voltage optimised for use in 12V systems and charging 12V batteries. Weatherproof and durable, perfect for permanent outdoor use on a boat, motor home, or in a garden. Lightweight, portable and complete with 1.8 metres of flexible cable. Only 20 watts of solar power available. High cost per solar watt compared to others. Requires additional solar charge controller. Requires additional blocking diode for battery charging. This 20 watt solar panel is currently on sale on Amazon through this link right here. This high quality waterproof 20 watt AKT solar panel is ideal for people who want to save money on their electricity bills and the environment, or were it would cost too much to install electrical cables to a shed or outhouse. This 20 watt panel is powerful and portable enough to be used to power hundreds of devices that you may use in a shed, boat or caravan such as lights and pumps and can still generate free renewable solar power on a cloudy day. Due to its rigid anodised aluminium alloy frame and 3.2mm thick tempered glass giving it exceptional strength, it is perfect for permanent outdoor use in the garden to provide free power either directly, such as powering a pond fountain or pump, or for keeping your car, caravan, boat or motorbike battery topped up around the clock. The 20W AKT Solar Panel can be connected together with other 20W AKT solar panels to form larger arrays for higher voltages or greater battery charging currents. The following table gives you an idea of what is possible with this small but versatile 20W panel. 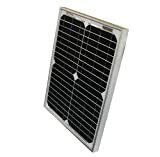 Note that the AKT-20-M solar panel can be connected together in either a series, parallel or a combination of both to give a higher output voltage or charging current from the array than a single panel. For example, 4 off AKT-20-M solar panels panels connected in series would give maximum operating voltage 70 volts (4 x 17.5) at 1.14 amps ( Vmp x Imp = 70 x 1.14 = 80W ). Likewise, 4 off AKT-20-M solar panels connected together in parallel would give 17.5 volts at 4.56 amps ( Vmp x Imp = 17.5 x 4.56 = 80W ). 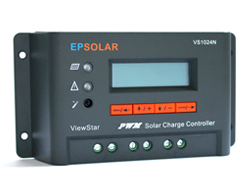 For off-grid battery charging applications, EP’s 10A Solar Charge Controller is a good choice. This powerful dual voltage (12V or 24V), 10A charge controller which uses PWM (Pulse Width Modulation) technology to extend the life of connected batteries and can work with sealed, gel and flooded batteries. Other features of the 10A Charge Controller include LCD display, LED indicators and friendly interface with 4 multifunctional buttons. The controller also allows you to set battery capacity, automatic cut off to prevent over-charging and deep discharge, over heating, over load, short circuit and reverse polarity protection of the connected batteries. This 20W solar panel can be used to charge batteries directly, but you may also be interested in this powerful 10 Amp solar charge controller by EP Solar which is designed to protect batteries whilst charging them. This high quality, brand new powerful 10Amp 12 volt controller accepts a wide range of input voltages from various solar array configurations making it suitable for off-grid and on-grid modules like the 20W AKT Solar Panel as well as many other solar panels up to 160W. When used to charge an off-grid backup battery system up to 36 volts, the VS1024N controller uses PWM (Pulse Width Modulation) technology which increases charge acceptance and prolongs the life of the batteries. Often the PWM technology can recover some lost battery capacity too giving full control via its built in display to a range of parameters and setting for a variety of battery load conditions. This charge controller also includes a full set of electronic protection functions such as reverse current, over charging, discharge, over heating, short circuit, reverse polarity, etc. protecting both your 20W AKT solar panel and the load. This 10 Ampere solar charge controller is currently on sale on Amazon through this link right here. The AKT Solar and CE logos assures the build and quality of the panel, so for more information, customer reviews about this 20W AKT solar panel, Click Here to visit Amazon, you won’t find it cheaper anywhere else. Free shipping is included also.